In search of adorable DIY pillow ideas? If you want to test your pillow making skills, here are 17 pillow ideas that will make your bed and couch look marvelous! Learning how to make DIY pillows is one of those perfect kind of crafts that everyone should master. DIY craft projects are so much fun especially when you're improving your home. Make decorative pillows or even throw pillow covers with this list of adorable DIY pillow ideas! Everybody would love to have something unique and cozy in their home, something that will make it a sweet looking place that will make the whole family happy. Cute-looking pillows would make a great accent on your beds and couch! They can also be given as an awesome gift! So why not make a couple? Here are 17 adorable DIY pillow ideas you and your kids will surely love! Before we go to the cute decorative pillows, it's always best to know how to make the basic throw pillow covers. Click here to see the easy tutorial! Adorable and oh-so-cute! Who doesn't love penguins. This will be a great throw pillow you can add to your room or your little girl's! Click here to get the tutorial! No sewing necessary. This do it yourself pillow cover looks so dainty and cuddly. Grab the tutorial here. Want to add some flower to your home that will stay fresh for a long time? Make this adorable felt flower pillow. Click here for the tutorial! Put more cheer to your DIY throw pillow cover with some pom poms. Click here to read more! 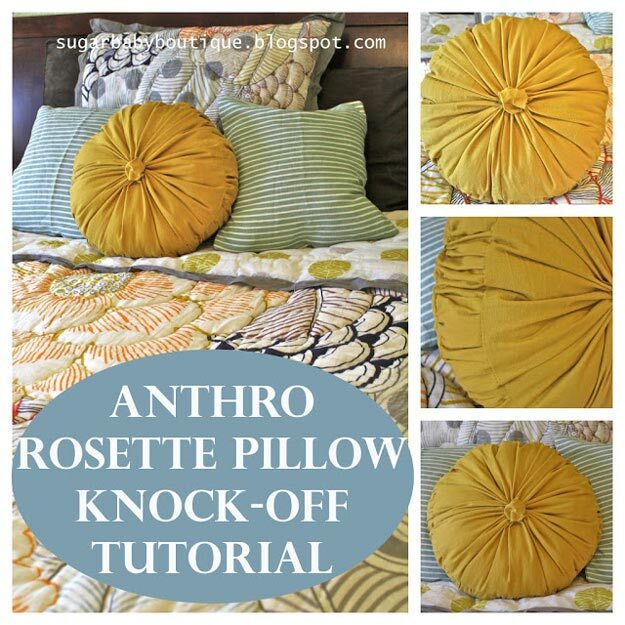 Got ten minutes, then you can make this easy DIY pillow cover. You no longer have to spend hours making one. Click here to see how it's done. These DIY pillows look so yummy!!! Take caution. Must. Not. Bite. or. Eat. You can find the tutorial here. Cuddling up is so much fun especially if it's this cute puppy dog with floppy ears you're hugging! Check out the how-to here. Upcycle your old t-shirts and make them into these cute vintage pillows! See tutorial here. Here's a cactus that I promise won't prick you. This decorative pillow is a bit ironic form the counter part it has in real life. Find out how to make it here. Who says you always have to have the real thing. Sometimes a little DIY is all you need and you can save a lot of money. Make this Anthro knock-off with this tutorial. Here's another cute and fun addition to your sewn collection! Check out the tutorial here. Add a bursting yellow hue to your room with this charming DIY decorative pillow! See the how-to here. Macaron pillows are exceptionally just the sweetest! Click here for the tutorial. Make decorative pillows with using stencils. Customize it in any form you want. I wouldn't mind putting my favorite quote on a DIY pillow. Click here for the tutorial. An easy peasy sewing project that you can make in a beat! See tutorial here. Car seat pillows are perfect for road trips! Check out the tutorial here. So which DIY pillow are you making today? Let us know below in the comments!